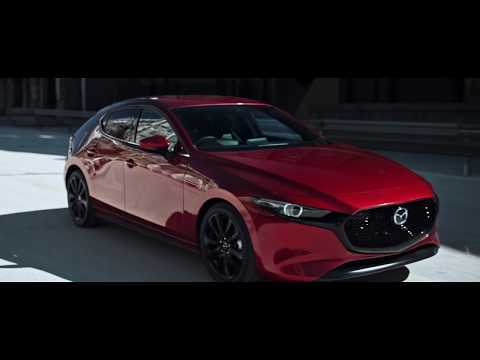 The All-new Mazda3 - launching in May 2019! Mazda's Kodo design concept is now at higher levels of depth and sophistication as it enters a new stage that raises car design to the level of fine art. In the exterior design of both All-new Mazda3 models, finely honed elements creating clean, beautiful designs combine with a delicate play of light and reflections to realise elegant and sophisticated styling with a natural, dynamic feel. The new Mazda3 is the first model to adopt this evolved version of Kodo design. While featuring a simple 'single motion' overall form, the way that light and shadows shift and reflections move over the body creates a highly vital and dramatic impression that goes beyond previous iterations of the design language. Another goal in styling the new Mazda3 range was to give each model its own distinctive design personality: the hatchback with its own more emotive design, and the saloon offering more elegant, prestigious proportions. The powerful and seductive look of the Hatchback has lasting visual appeal that evokes a sense of excitement. In contrast, the clean, sleek and sophisticated beauty of the Saloon speaks of maturity and refinement. The result is two body types with personalities so distinct one might even think they were completely different models. The design concept for the hatchback focused on creating a powerful form that conveys a fresh approach to hatchback styling. When viewed from the rear, the cabin and body come together to appear as a single solid mass. This unique form creates a powerful presence and an expression of seductive and lasting appeal. The design concept for the saloon is 'sleek and elegant'. While conforming to traditional saloon styling by bringing together the bonnet, cabin and boot as three distinct elements, the development team aimed to enrich the styling of these elements and achieve a new level of beauty that befits a Mazda saloon. The result is a refined, mature expression of elegance. This is the first new Mazda to feature Mazda’s innovative Skyactiv-X SPCCI (Spark Plug Controlled Compression Ignition) engine. Features include superior initial response, powerful torque, faithful linear response and free-revving performance. The engine is assisted by Mazda’s intelligent new M Hybrid system, which supports greater gains in fuel economy, and achieves higher levels of driving pleasure and environmental friendliness. The new M Hybrid system is also available for Skyactiv-G engines. The Active Driving Display, meters and center display have been redesigned to present information in a clearer fashion, while the fonts used were unified for visual consistency. The All-new Mazda3 features an 8.8-inch wide center display - offering simplified operation via the commander control, it also features a new intuitive guidance system that makes the commander control easier to operate. Mazda’s MZD Connect system now includes a Digital Owner’s Manual as an app. When a warning appears on the centre display, it is accompanied by an indication of the priority level and a link to the Digital Owner’s Manual. The driver can then quickly access the manual for an explanation of the warning and instructions on how best to respond to the situation. The 8-speaker standard audio system uses a three-way layout, with 3L woofers positioned on the sides of the front cowl, a pair of 2.5cm tweeters on the sail garnish and 8cm squawkers on the upper section of the front and rear door trim. The 12-speaker Bose® sound system adds an 8cm centre speaker, a pair of rear satellite speakers, and a subwoofer. It also features custom tuning to provide more powerful bass and higher audio quality. The new Mazda3 is available with Mazda’s newly developed Driver Monitoring system. The system uses both an infrared camera and infrared LED to observe the driver’s condition while driving. It monitors how wide open the driver’s eyelids are at any given time, the number of times he or she blinks, and also the angle of the mouth and face in order to determine levels of drowsiness or fatigue. It also monitors the driver’s line of sight and eye movement to determine when the driver is being inattentive. If the system judges that the situation has become dangerous, it sounds an alert to make the driver aware and works in conjunction with the Smart Brake Support (SBS) system to shorten the time required for the brake warning to sound. We would love to keep you informed about the fabulous All-new Mazda3 - please just complete the brief form below, and we'll ensure we keep you completely in touch with all product news! In addition, we will ensure you receive advanced notice of our Launch details, including priority invitations! We take your privacy seriously - in order for us to respond to your enquiry, please indicate the most appropriate contact method(s) below. We will only use your personal information to administer your enquiry and to provide the products and services you have requested from us. You can see how we process your data and understand your rights by reviewing the Privacy Notice found on our website. By submitting your contact data in the form provided, and ticking the ‘Opt In Consent’ box, you consent to us processing your personal data in accordance with our Privacy Notice.